I know it’s finally Spring when my backyard shade garden becomes filled with mint plants. I decided to take advantage of my mint abundance and make a recipe I’ve been dreaming up ever since a photo in Paul Gayler’s A Passion for Vegetables caught my eye: 4 young zucchini hollowed into tubes and filled with…something. Never mind what was inside Paul’s zucchini–it wasn’t vegan, anyway. I just liked the look of them, but it took the arrival of the Spring herbs to turn on the lightbulb over my head. Trim the ends off the zucchini. Using an apple corer, remove the flesh from the zucchinis, being careful not to cut through the outer wall. Chop the zucchini flesh and measure out 1/2 cup; set the remaining zucchini flesh aside for another use (I added it to the Middle Eastern Red Lentil Soup I served with this). Heat a non-stick skillet over medium-high heat and sauté the 1/2 cup chopped zucchini, onions, and garlic until onion begins to turn translucent, about 3 minutes. Add the pine nuts and stir and cook another two minutes. Remove from the heat and stir in the rice and remaining ingredients. 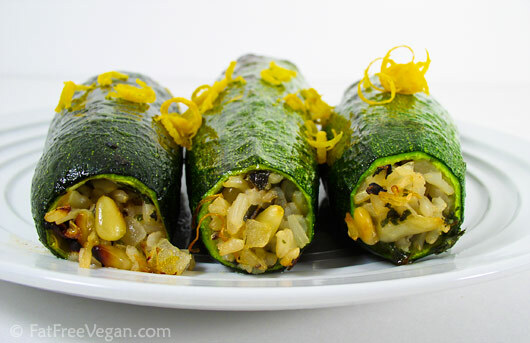 Use a small spoon to fill the hollowed zucchini with the rice mixture. Work from both ends, making sure zucchinis are completely filled. Brush or spray them quickly with a small amount of olive oil, if you like, and place them in a dish under a preheated broiler for 10-15 minutes, watching carefully and turning regularly, until tender and lightly charbroiled. If you have to make this with dried herbs, just use about 1/3 of the amount called for. And I have to say that the rice tastes wonderful on its own, so consider making it as a side dish if you don’t feel like stuffing zucchini. This recipe is geared toward what’s fresh in my garden right now, so feel free to experiment with other herbs. I feel very fortunate that I have oregano that stays green year-round, parsley that never dies, and, most important of all, parents who grow Meyer lemons! If I were to make this recipe later in the summer, I would definitely choose to use plenty of basil and perhaps fresh tomatoes, and I would cook them on the barbecue grill. But that’s something to look forward to in June. these look so elegant.I’m sure they are also delicous. Sounds awesome! And looks quite spectacular too. You are fortunate to have some fresh herbs year round. Our oregano is just now coming back after the last 5 months on hiatus. Looks great! I thought it was a rolled sushi at a glance. 🙂 It is a very creative way to use zucchini. Love it! Thanks, Isil. They were really good! Hey Chris! Yep, I love the oregano and parsley, but my true love is basil. It’s about time to set basil out now; I’m just waiting until April 1 to avoid a sudden frost. Hi SIV! You know, we were joking about it being zucchini sushi when we were eating it. If you slice it into little rounds, it looks just like sushi. It got my daughter to eat more zucchini than she’s usually eat! Wonderful combination and a great new way to stuff a zucchini! BTW, I love the name of your blog. That’s the first question in my family, too, but mostly because, being vegan, it’s always a question of finding anything suitable at all! Thanks, Catherine! I’m currently fascinated by those stuffed portobellas that you made. You may see me veganizing them soon! Wowee is that gorgeous! And lucky you are – with your year-round access to herbs and folks who grow Meyers lemons!? How cool is THAT? Wow – this looks fantastic. This is amazing Susan! You take wonderful photos. Looks way better than my similiar attempt at dolmas. I need to buy some pine nuts! Ohhh yum – this is definitely being added to my growing list of recipes to try. Thanks for sharing! These look wonderful – a definite addition to my list of things to cook after spring break. Beautiful! This was terrific, even with dried herbs and with walnuts instead of pinenuts. Though perhaps not as elegant, it was easier for me to halve the zucchinis the long way and hollow them out like canoes…I’ll make this again!